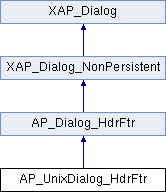 References AP_Dialog_HdrFtr::FtrEven, AP_Dialog_HdrFtr::FtrFirst, AP_Dialog_HdrFtr::FtrLast, AP_Dialog_HdrFtr::HdrEven, AP_Dialog_HdrFtr::HdrFirst, AP_Dialog_HdrFtr::HdrLast, m_spinAdj, m_wHdrFtrCheck, m_wRestartButton, s_FtrEven(), s_FtrFirst(), s_FtrLast(), s_HdrEven(), s_HdrFirst(), s_HdrLast(), s_restart_toggled(), and s_spin_changed(). References _connectSignals(), abiDialogSetTitle(), AP_Dialog_HdrFtr::FtrEven, AP_Dialog_HdrFtr::FtrFirst, AP_Dialog_HdrFtr::FtrLast, AP_Dialog_HdrFtr::getRestartValue(), XAP_App::getStringSet(), AP_Dialog_HdrFtr::getValue(), XAP_StringSet::getValueUTF8(), AP_Dialog_HdrFtr::HdrEven, AP_Dialog_HdrFtr::HdrFirst, AP_Dialog_HdrFtr::HdrLast, AP_Dialog_HdrFtr::isRestart(), localizeButton(), localizeLabel(), localizeLabelMarkup(), XAP_Dialog::m_pApp, m_spinAdj, m_wHdrFtrCheck, m_wRestartButton, m_wRestartLabel, m_wSpin, newDialogBuilder(), and s.
A check button has controlling a footer type has been changed. Referenced by s_FtrEven(), s_FtrFirst(), s_FtrLast(), s_HdrEven(), s_HdrFirst(), and s_HdrLast(). The Check button controlling whether page numbering should be restarted at section has been changed. References m_wRestartButton, m_wRestartLabel, m_wSpin, and AP_Dialog_HdrFtr::setRestart(). Update the XP values of the spin button. References _constructWindow(), AP_Dialog_HdrFtr::a_CANCEL, AP_Dialog_HdrFtr::a_OK, abiRunModalDialog(), m_windowMain, AP_Dialog_HdrFtr::setAnswer(), and UT_return_if_fail. Referenced by _connectSignals(), _constructWindow(), and CheckChanged(). Referenced by _connectSignals(), _constructWindow(), and RestartChanged(). Referenced by _constructWindow(), and RestartChanged(). Referenced by _constructWindow(), RestartChanged(), and RestartSpinChanged().